Eco-friendly triangle swimsuit with Oeko Tex Standard 100 recycled polyester exterior and cotton-lined interior. Model with Removable Cups, Adjustable Briefs with bow, to ensure comfort adaptability and respect of sensitive skin. Very bright fabric with pink and mauve pattern on lime green background. 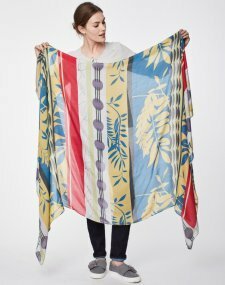 Properties: UV 30 sun protection, hyper-breathable, Oeko tex certified for compatibility for underwear and children under 36 months, chlorine-resistant and anti-piling fabric. Composition: external 87% recycled polyester deriving from PET bottles, 13% elastane. Cotton interior. 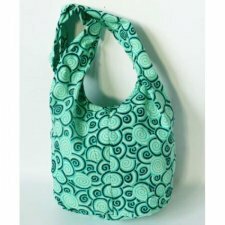 Beautiful colored bag in fair trade cotton with spiral print, made entirely by hand by Hmong women of Thailand. 1 large zip pocket, 1 small front pocket with zip. Colors: green, blue, brown/orange or gray/black. Hand made in Thailand by Ethnic Lanna.